On Syrian borders, Turkey and Israel have become aggressive with their efforts to destabilize the nation. Reports from mainstream propaganda claim that Syrian violent strikes have prompted Israeli retaliation in the occupied area of Golan Heights. Turkey has issued new warnings to Syria that they will defend themselves against “violation of territory”. Turkey has been working with the Zionist-controlled US and CIA operatives in their own country. With the building of a CIA training base in Turkey, the fake-terrorist faction, al-Qaeda, has been able to recruit young men to fight for the Free Syrian Army (FSA) in Syria – the proxy war being supported by the US and UK. It is revealed that Israel and the UN NATO forces stepped aside as Assad’s forces came into Golan Heights. The result was Israel firing missiles to “stir up the Golan front” to manufacture “tension on the border” to show support of the Syrian government. Hillary Clinton, US Secretary of State has called for the creation of a new council to defend the rights of the Syrian people as defined by the UN, US and UK. This new leadership group would be expected to take more direction from those hired terrorists fighting the battles in Syria. This was one of the foundational principles of the umbrella faction called the SNC. George Sabra, selected leader of the SNC claims to be a Christian who studied in Israel and the US. Sabra has a degree in educational technology and geography; as well as having worked for the globalist-controlled Sesame Street. Yet, Sabra’s ties to the Muslim Brotherhood through Salafis make him the perfect leader for the SNC. Sanctioned by the UN to be a shell organization that can provide weapons to Syrian terrorist factions like the FSA, take control over national resources and smuggle weaponry to designated hands is the purpose of the SNC. These factions depend of the support of the UN and cohorts to supply them with military-grade weapons, tanks and heavy artillery. 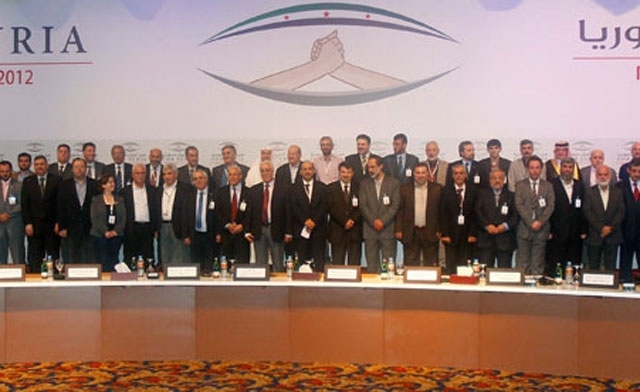 The SNC consists of “representatives from all opposition groups that are fighting to topple” the Syrian government headed by Assad. The members are Muslim Brotherhood and other Islamic extremists who came together in August of this year to form the SNC. They employed the support of the US and UN when they proved to be a vital tool in coercing activists and minorities to rally behind their covert-Zionist agenda. They were originally called the National Coalition for Syrian Revolution and Opposition Forces which was designed to facilitate money laundering through governmental channels to the appropriate terrorist factions fighting by-proxy for the Zionists against Assad. Having originated out of talks in Saudi Arabia, those from the US and various Arabian nations; including members of approved terrorist factions and political dissonant have united to become the defacto-government chosen by the Zionists to replace Assad. Developed by the UN, the European Union and the US, the SNC is being primed to become the next mandatory and crucial step in destroying Syrian sovereignty and replacing it with Zionist-controlled “democracy”. Given the power by the UN, the SNC is expected to take the National Transitional Council’s seat at the UN, as Saudi Arabia and Zionist forces seek to delegitimize this defacto-government running Libya. Iran is scheduled to host a meeting between the National Syrian Council and the Syrian government in the hopes to facilitate talks concerning political differences, minorities and Syrian ethnicities as well as state and oppositional compromises. US rhetoric claims that Iran is still in pursuit of nuclear weapons, giving the Obama administration justification for stricter sanctions under direction of the American Israel Public Affairs Committee (AIPAC). The reluctance of Obama to clearly define how he intends to deal with the allegations of Iran’s nuclear program could be a scheme to destabilize the Middle Eastern nation for the sake of the Zionist agenda. Cover operations in Iran include the use of manufactured riots with the intention of creating an Arab Spring in the region to facilitate destabilization. Paula Broadwell: Did Neocon Honeypot Take Down Petraeus?